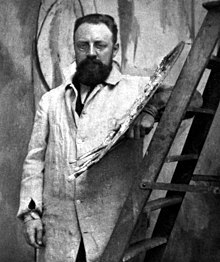 Henri-Émile-Benoît Matisse (French: [ɑ̃ʁi emil bənwɑ matis]; 31 December 1869 – 3 November 1954) was a French artist, known for both his use of colour and his fluid and original draughtsmanship. He was a draughtsman, printmaker, and sculptor, but is known primarily as a painter. Matisse is commonly regarded, along with Pablo Picasso, as one of the artists who best helped to define the revolutionary developments in the visual arts throughout the opening decades of the twentieth century, responsible for significant developments in painting and sculpture. Although he was initially labelled a Fauve (wild beast), by the 1920s he was increasingly hailed as an upholder of the classical tradition in French painting.His mastery of the expressive language of colour and drawing, displayed in a body of work spanning over a half-century, won him recognition as a leading figure in modern art. Matisse's used pure colors and the white of exposed canvas to create a light-filled atmosphere in his Fauve paintings. Rather than using modeling or shading to lend volume and structure to his pictures, Matisse used contrasting areas of pure, unmodulated color. These ideas continued to be important to him throughout his career.The human figure was central to Matisse's work both in sculpture and painting. As seen from Sailor 1, the importance for his Fauvist work reflects his feeling that the subject had been neglected in Impressionism, and it continued to be important to him. At times he fragmented the figure harshly, at other times he treated it almost as a curvilinear, decorative element. Some of his work reflects the mood and personality of his models, but more often he used them merely as vehicles for his own feelings, reducing them to ciphers in his monumental designs. Henri Matisse's style of art, although arcane, adopted a 'wild beast' style of painting, using pure colors and white on the canvas to create a form of contrast shows Henri's revolutionary impact on society. I found his daring attempt to revolutionize French Art an admirable trait, a trait that can be seen from his paintings.